Given Palestine is part and parcel of an Arab culture that was the cradle of civilization, is home to the oldest cities in the world, and provided humanity with significant contributions towards the development of many “modern” sciences, such as physics, chemistry, medicine, mathematics and astronomy, one can only assume Romney sees no value in any of these – or is entirely ignorant of them. Instead, he views Israel as the “miracle,” a 64-year-old country that was built on the ruins and ashes of the indigenous Palestinians, many of whom refuse to submit to a continuing campaign of slow – and sometimes not so slow – removal from the land. The likely GOP presidential nominee also overlooked the fact that the Arab world was home to the world’s three great monotheistic religions – Islam, Christianity, and Judaism – long before any modern state of Israel was even conceived. As if these racist remarks were not enough, Romney uttered the magic conceptual ingredient, God. He said that he is “overwhelmingly impressed with the hand of providence (and how Israelis) are able to build and accomplish things that could only be done by a species created in the image of God.” This perverted reference seems to indicate that others, like Palestinians or even his own people, Americans, are of a lesser “species,” unable to match Israeli accomplishments. Romney also praised Israel’s economic accomplishments while bashing the Palestinians’. The presidential candidate totally ignored the principal reason for the huge discrepancy between the Israeli and Palestinian economies: Israel’s military occupation of Palestinian territory and total micromanagement of that economy. I suspect Bain Capital would not have succeeded had the Israeli government restrained its every effort. Furthermore, Israel’s economy is subsidized with over $3 billion in U.S. military aid every year. That military aid helps repress Palestinians. Over the years, not only has Israel prohibited the emergence of a new Palestinian economy – it has structurally and systematically made certain that even the buds of such a productive economy would never see the light of day. Anyone who scratches the surface of all the political spin can see for themselves what the World Bank now repeats: that Israel’s “apparatus of control” has “become more sophisticated and effective in its ability to interfere in and affect every aspect of Palestinian life, including job opportunities, work, and earnings … (turning) the West Bank into a fragmented set of social and economic islands or enclaves cut off from one another.” Besieged Gaza is in far worse shape than the West Bank. The International Monetary Fund and the European Union are making similar points. Given that so many respected international organizations and analysts see reality for what it is, the question is what is being done about it. For Romney the answer to the Palestinians is crystal clear: Give up. After all, in his view Palestinians are “culturally” defective and God is on the other side. As an American, before even speaking as a Palestinian, Romney scares me – seriously scares me. President Obama may have failed the Middle East in his first term as he picked up the pieces of eight years of damage caused by George W. Bush’s administration, but Romney has exposed his extraordinary American ignorance in the land of the prophets. he trip of Republican presidential hopeful Mitt Romney to Israel is in bad taste for lots of reasons. He is holding a fundraiser at the King David Hotel in Jerusalem. It is distasteful for an American political candidate to hold a high profile fundraiser abroad, implying a commitment to a foreign country as a means of reaching out to American interest groups (in Romney’s case, Christian Zionists among the evangelicals and the minority of American Jews who would be willing to vote Republican). It is distasteful that Romney has broken his pledge of transparency and declared the fundraiser off limits to the US press. It is distasteful that Romney won’t explain why he has abruptly gone back on his word, and closed the Jerusalem event to the press. There is a convention in US politics that you don’t criticize the sitting president, even if you are an opposition politician, while on foreign soil. 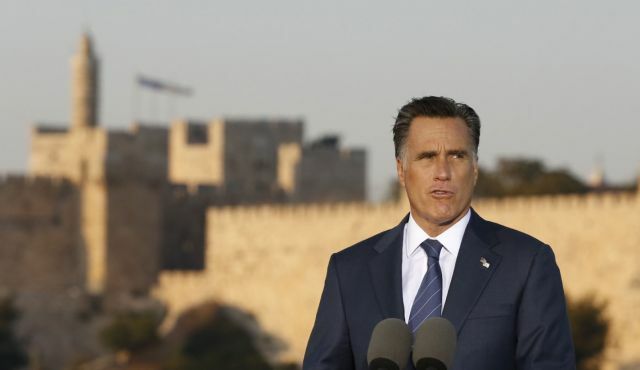 Romney clearly intends to slam President Obama while in Israel. It is distasteful that Romney is clearly holding the event in some large part to please casino mogul Sheldon Adelson, who first bankrolled Newt Gingrich and now is talking about giving $100 million to elect Romney. Adelson is a huge supporter of far rightwing Likud Party Prime Minister Binyamin Netanyahu, and published a free newspaper in Israel to support all things Bibi all the time. Adelson isunder investigation for allegedly bribing Chinese officials in Macau in reference to his casino empire there. Since Adelson is potentially an agent of Chinese influence and is a partisan of one of Israel’s most rightwing parties, Romney’s indebtedness to him is disturbing. It is distasteful to have Israeli Prime Minister Binyamin Netanyahu interfering in an American domestic election by openly favoring Romney over Obama. It is distasteful that Romney will not meet with Mahmoud Abbas, president of the Palestine Authority, who actually was elected by Palestinians, but only with an appointed and toothless ‘prime minister’ known for cooperation with Israel’s Likud. It is distasteful the Romney will not commit to a two-state solution within 1967 borders or demand Israel cease illegal squatting on and unilateral annexation of Palestinian land. If he is going to this Middle East hot spot, why doesn’t he visit a Palestinian refugee camp so as to understand the nub of the dispute, instead of hobnobbing with the uber-rich in Jerusalem. It is distasteful that he is holding the fundraiser in the King David Hotel, which was famously blown up by the Zionist terrorist organization Irgun in 1946, in a strike that killed 91 persons and wounded dozens, many of them innocent civilians. Irgun leader Menachem Begin (later a leader of the ruling Likud Party) hit the hotel because there were British security offices there, which were tracking violent organizations like his own, during the British Mandate period of Palestine. He maintained that he called ahead to warn of the bombing, but that is just propganda to take the edge off the deed – who in 1946 would have taken such a call seriously? When current Israeli Prime Minister Benyamin Netanyahu and other Likud leaders attended a commemoration of the bombing, the British Foreign Office sent over a sharp note of protest. I guess Romney is not finished with insulting London. Mitt remains a flip-flopping example of Amerikans ruling puppet class whose life and beliefs are provided for him by the NEOCONs – no doubt he gets traction in Jerusalem – but I fail to see how he could possibly bend over more and take it like Obama has shown he can. They have the same boss – where is someone suggesting an alternative view – Ron Peace Paul is the chap I would like to hear from. Will Mitt the Nit come out and criticize Israel for attacking the USS Liberty? I consider Romney the lesser of two evils. Adelson is said to know a lot about domestic zionist participation in 9-11-2001 activities. The most distasteful concept associated with Mittens’ visit to Israel is the possibility that he is coming back to the U.S.. Seems like americans have really no choice in the next election. It is as usual both sides owned by the zionists. The man is a walking nightmare. I am surprised he never said the new Jerusalem/ holyland is in Missouri (which is what Mormons believe).